Sheer khurma, Sheer korma is a traditional dessert made during eid ul-fitr with fine variety of vermicelli, dates, milk and nuts. The rich kheer recipe, made during the Ramadan day and it's a must one for this festival. Here in Singapore they call the festival as Hari Raya. I wanted to post this recipe of sheer khurma from last year but somehow i could make it only during this year. I remember reading about this Seviyan kheer for the first time in my son's SST book, while reading with him, festivals of India. I made this for my guests yesterday and it was a super hit. 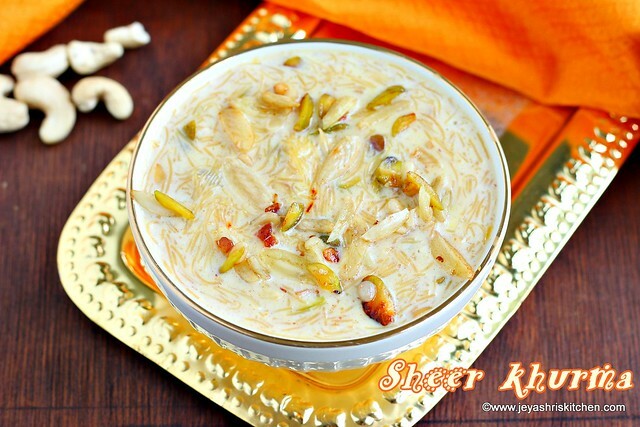 The kheer was similar to our semiya payasam but was too rich with nuts, dates and condensed milk. Usually they use fine variety of semiya for this sheer khurma. We get this in Mustafa center. If you don't get this in your place, use normal roasted semiya|vermicelli. 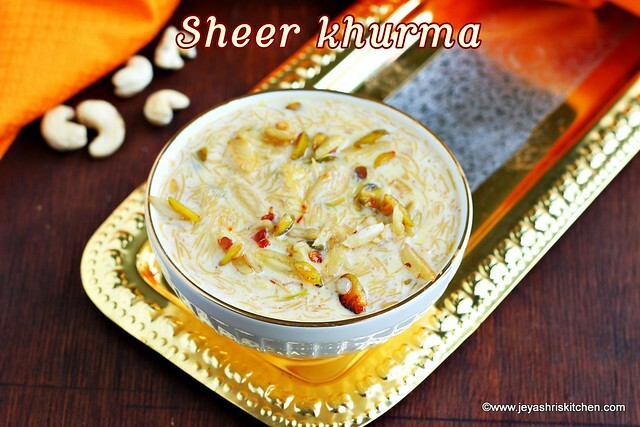 Sheer khurma, Sheer korma is a traditional dessert made during eid ul-fitr with fine variety of vermicelli, dates, milk and nuts..
Soak the nuts in very hot water for 15 minutes. Take out the skin from almonds and pistachios and pat dry them. I soaked chironji too, but later found it very difficult to get rid of the skin. So add chironji with skin or dry roast it and phew the skin away. Chop almonds, pista and cashew nuts lengthwise. Chop the dates too. If you get dry dates in your place, soak and use that. In a pan add ghee and add the nuts and dates. Roast them slightly, no need to golden brown. Take out few for garnishing. In the same pan along with the nuts add the vermicelli. I used roasted vermicelli. If using non roasted one, separately roast it and then add. Allow this to cook on a medium flame. Stir in between. The vermicelli will gets cooked very soon and it will make the milk thicken soon. Once it gets slightly thickening, add the condensed milk. Add the saffron to this and mix well. The payasam will gets thick after it cools down, so check for the right consistency. Garnish with the nuts which we kept aside. Sheer khurma is ready to serve. 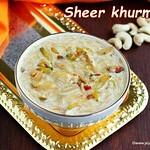 Use thin variety of semiya for sheer khurma. Adding condensed milk gives richness to this dessert, you can replace this with sugar too. I use the fine variety of semiya. Looks yummylicious jeyashri. Great dessert to accomplish any feast. Will try it soon. Eid Mubarak.